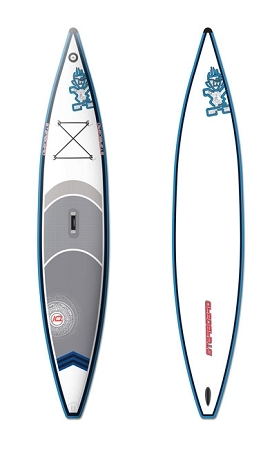 > Starboard Astro Touring 14'0"x30"
Based on our famous Touring 12'6"x30", the Astro Touring provides great glide and stability. It's fast enough to win regional races. The generous volume allows paddling with extra luggage or children aboard. All Touring boards use super-stiff 6" drop-stitch materials. The Touring 14'0"x30" is simply faster, has more glide and stability. RACE CONE For better rigidity, shape precision and strength, the fighter plane inspired Race Cone is built into the critical nose section of all our Astro Racers and Touring boards. All the race results and media test reports further underlines the advantages.